September has been busy, in a bad way. Between the Literary Auction (an incredible inspiring statement of your generosity–but immensely time consuming to organize), my HR job (we are moving offices, and I’m in charge of the move–and it’s been exhausting and challenging and aggravating for various reasons), and with my teaching job (after spending all day moving, sometimes literally moving boxes into a truck for hours on end, I go home to do lesson plans, to grade papers all night, to work with students and I wake up at 6am the next day to teach class)…between all this, I’ve got zero time to rest. I’ve got time for Farm Town, and that’s it. And I’ve only got time for Farm Town, because that’s the only way I can unwind. I’m exhausted. No sleep. Nonstop work. Stress. Deadlines looming. My muscles scream. Too tired to be frustrated. Too tired to even cry and beg for mercy about this pace. I’m too tightly wound to read, to let my mind wander into another dimension, even though I’ve got an awesome new Kindle (that I don’t have time to play with). My dogs are needy and sad that I’m not around. We’ve been eating odds and ends all week. I’ve not written a single word of fiction down. I’ve not had time to think about my novel. It has given me opportunity to ponder how much more satisfied I would be with myself if I didn’t make writing such a central part of my life. I’ve certainly achieved a lot this month despite not getting any writing done. I chewed on that thought awhile. Writing slays me. But then I realized that without writing, my life itself would be unsatisfying. I’m looking forward to October. The good news is that October is only a few days away! September is not all bad. There are dry farmed early girl tomatoes at the market. Wonderful chance encounters, like running into a good friend at the market, in front of those tomatoes. The wild turkeys are prancing about on the streets. 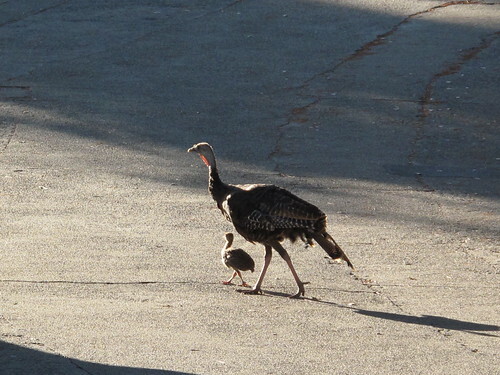 One of the turkeys just had a baby (rather late in the season, but still a welcome sight). I picked a triamble squash off the vine today, and it’s out in the sun, curing. And Fall is around the corner. I cannot wait to break out my scarves. And then, to settle down in front of my laptop and focus on my novel again.